Everyone in America gets Taco Bell on Wednesday, thanks to basketball. More specifically, thanks to the Golden State Warriors' victory over the Cleveland Cavaliers on their home court in Game 3 of the NBA Finals last week. While Warriors fans are rubbing the giveaway in Cavs fans’ faces, everyone -- even those who don’t follow basketball -- have something to celebrate: free tacos. 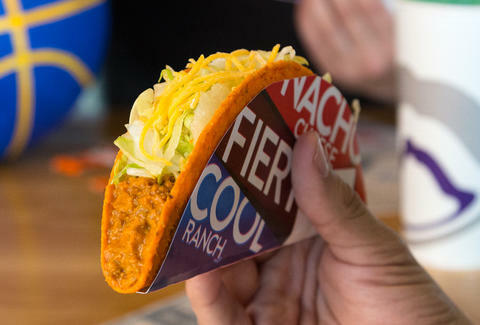 Here's the deal: Head to your local T-Bell any time between 2pm and 6pm (local time) on Wednesday, June 13, and they'll give you one free Doritos Locos Taco. That's it. You don't need a coupon, you don’t need to download an app, and best of all, you don't even need to buy anything -- though, you'll likely end up adding a Crunchwrap or two to complete your meal. In any case, don't forget to grab a few packets of Fire Sauce. Oh, and maybe get there a little early so you can get a good place in line. The giveaway is the result of Taco Bell's annual "Steal a Game, Steal a Taco" promotion and was officially triggered when the Warriors defeated the Cavs 110-102 in Game 3 of the NBA Finals in Cleveland on June 6. For the third year in a row, the chain promised free Doritos Locos for everyone in America in the event that the away team wins -- or “steals” -- a game on the home team’s court during the big hoops tournament. Taco Bell has also staged a similar promotion during the World Series in recent years. The free taco feeding frenzy -- much like the Warriors' sweep in the Finals -- was pretty much expected. While it marks the third year Taco Bell has teamed up with the NBA to unleash the flavored tortilla chip-taco hybrids (and maybe some indigestion) on America, it also cements the Warriors' status as taco heroes, considering the team won everyone free tacos when they beat the Cavs in Game 3 of the Finals last year and when they did the same in Game 4 back in 2016. Of course, you don't have to be a Warriors fan or Cavs fan -- or even much of a basketball fan in general -- to enjoy the free tacos. That's kind of the whole point. "'Steal a Game, Steal a Taco' adds another level of competition to the mix and unites fans to rally around something everyone can get behind -- free tacos," Kerry Tatlock, the NBA's head of marketing partnerships, said in a recent statement. Whether Cavs fans are brave enough to eat their feelings at Taco Bell on Wednesday remains to be seen. Tony Merevick is Senior News Editor at Thrillist and was temporarily interested in basketball for this whole thing. Send news tips to news@thrillist.com and follow him on Twitter @tonymerevick.